What’s the Difference Between C-44 Basin Runoff and Lake Okeechobee Releases along the St Lucie River/Indian River Lagoon? The locks are back in the news again. WPTV, “hard working for the river reporter,” Jana Eschbach, broke the story yesterday, that the Army Corp of Engineers did not alert the public that they would be releasing polluted canal, C-44 basin water through the S-80 structure into the St Lucie River. Jana, like most people, feels that the public should be alerted when polluted water will be coming into the estuary in that we swim and fish. She is also concerned the water in the area of Palm City and the Roosevelt Bridge, which has been reported to have high levels of bacteria, will be pushed to the popular Sandbar area. This can be confusing. Don’t we just care about lake water? 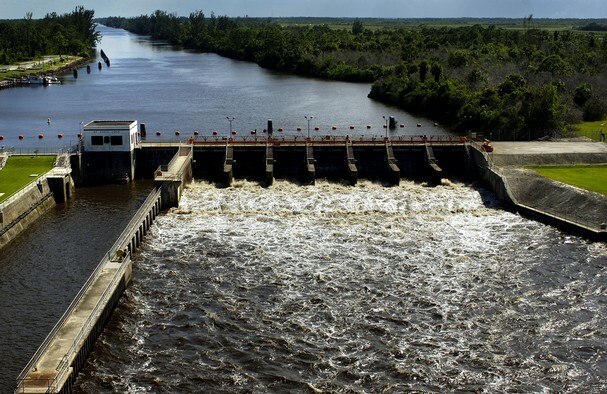 Also, if the locks are open, doesn’t that mean the ACOE is releasing Lake Okeechobee water? Not necessarily, and the basin water can be just as damaging to the estuary and the public. So how does releasing basin or lake water work? 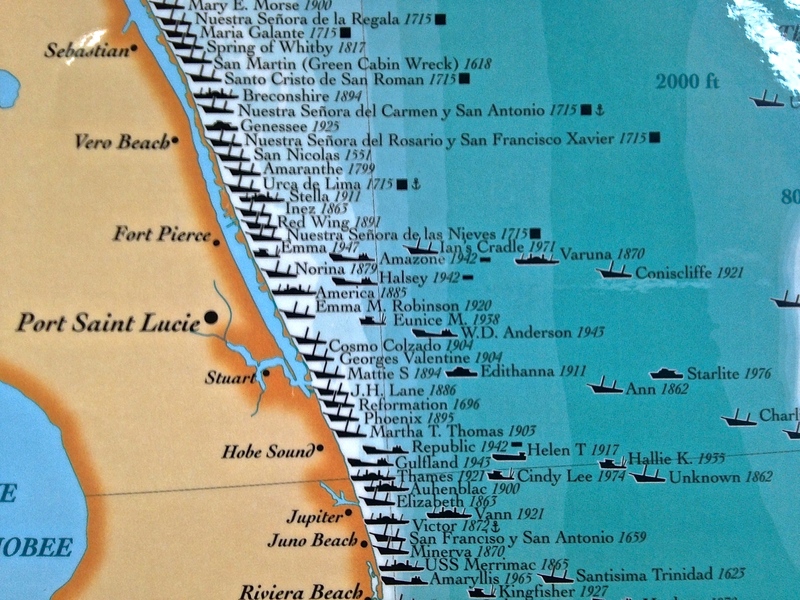 There are two structures along the C-44 canal which runs along the side of Highway 76 from the South Fork of the St Lucie River, to Lake Okeechobee: S-308 at the edge of Lake Okeechobee, and S-80, 20 miles or so, east, at the St Lucie Locks and Dam. 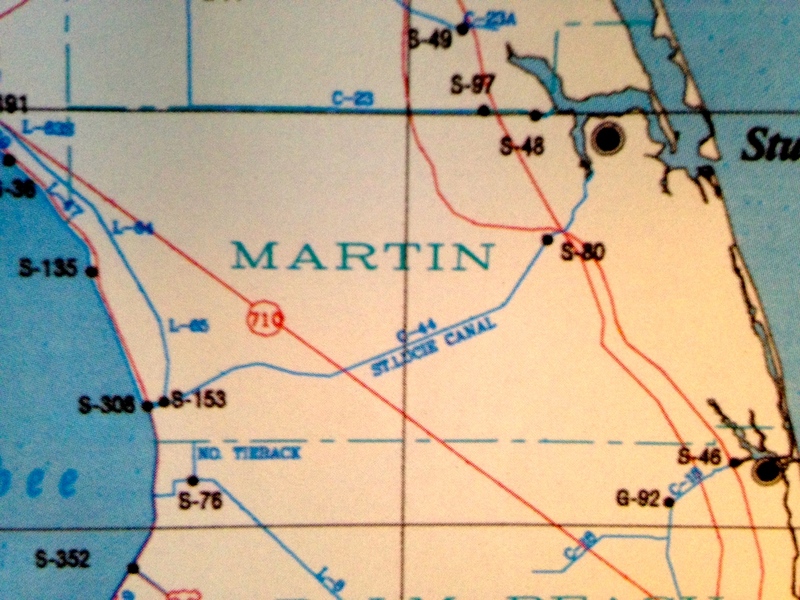 This ACOE canal and structure map shows S-308 at Lake O. and S-80 along the C-44 inland. S-80 serves duel purposes. First to release water through Lake Okeechobee, but only if S-308, at the lake, is open first, allowing water into the C-44 canal. Then S-80 lets the water pour into the St Lucie River. Second, S-80 can be opened just to allow water from the C-44 to flow into the St Lucie River, as the C-44 canal is surrounded by a 185 square mile basin, mostly agriculture, that has been directed to flow into the canal when it rains. Agriculture also uses this water in the C-44 canal to water their crops. 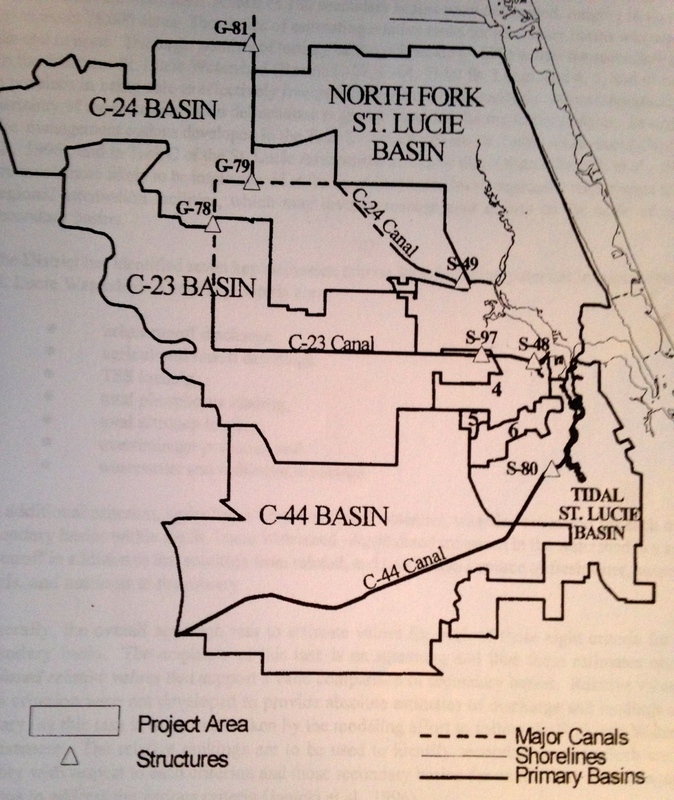 To make things more confusing, C-44 can “deliver” local basin runoff in both directions: to Lake Okeechobee and to the St Lucie Estuary. The ACOE decides where the water “needs” to go by opening and closing the structures of S-308 and S-80. 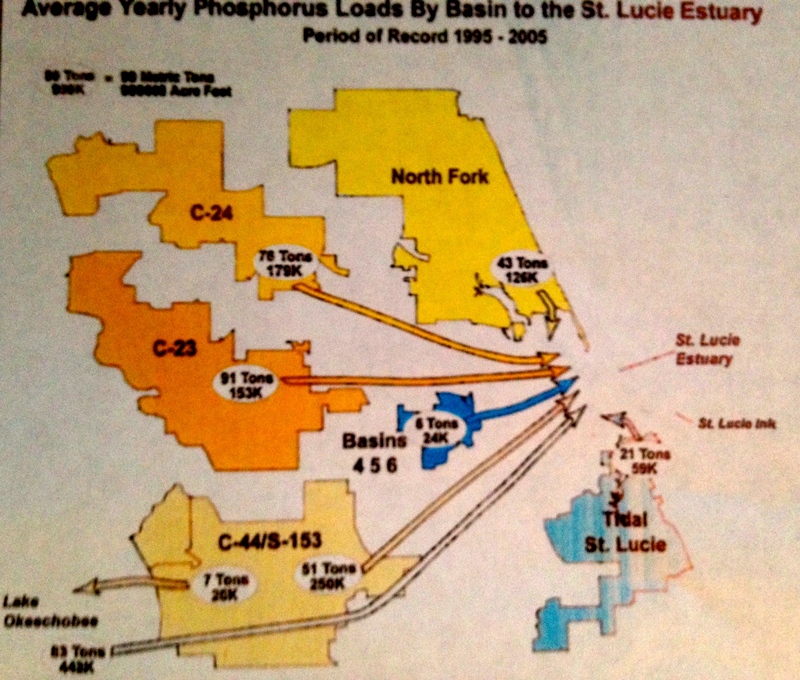 It must be noted that the water from the C-44 basin is polluted, as is the water from Lake Okeechobee. 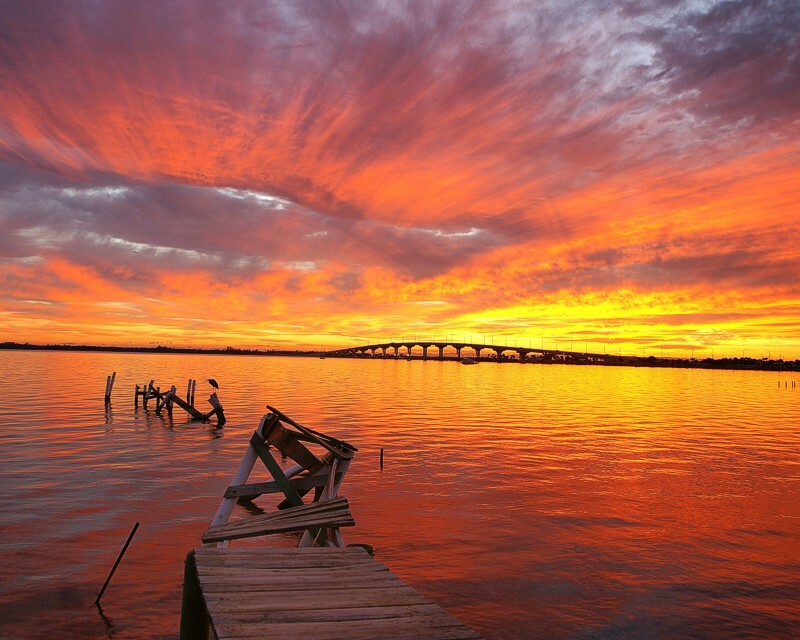 The Florida Department of Environmental Protection writes: “…the construction of the C-44 canal has had the greatest impact of the St Lucie Estuary–and nearly all of that impact has been bad, FDEP 2001.) 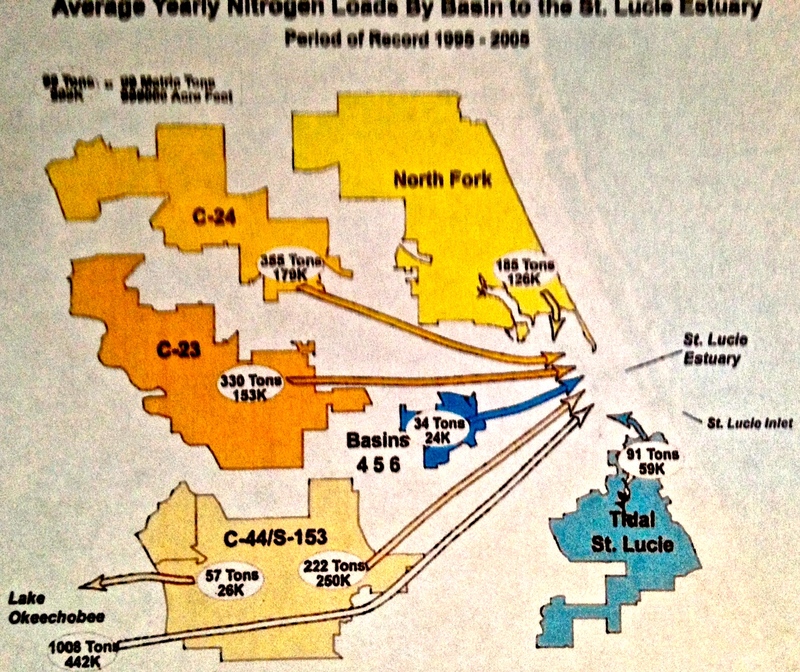 The charts below show how much nitrogen and phosphorus come into the river from the C-44 and other basins. 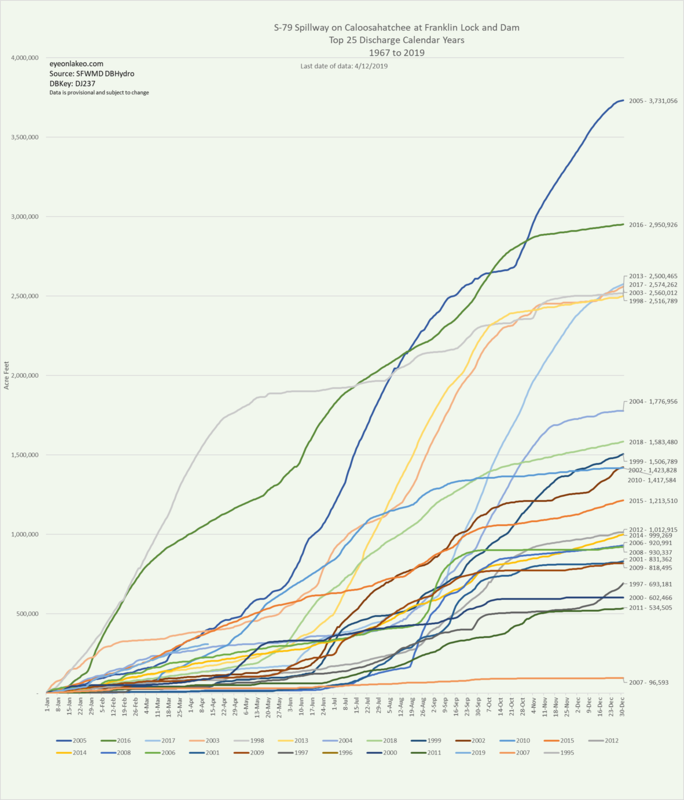 C-44 is the highest. Phosphorus and nitrogen mostly from fertilizer, feed toxic algae blooms in the hot summer months. 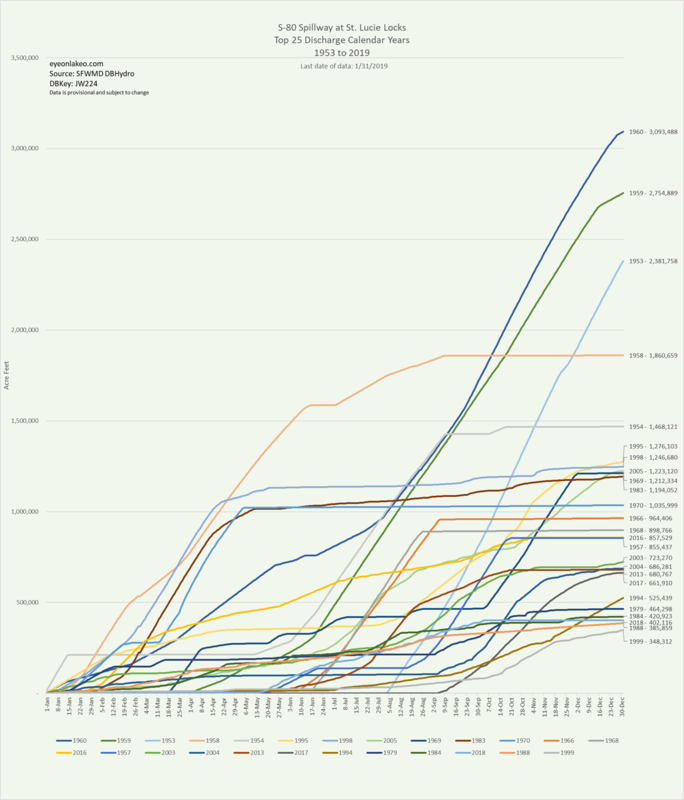 Fortunately, there is good news due to the help of our local, state and federal governments. The almost 3 billion dollar “C-44 Storm Water Treatment Area/Reservoir” has received first stage fundings and is under construction in Indiantown. It has been since 2011. This reservoir will hold the release water from the C-44 basin and clean it before it is returned to the St Lucie River. 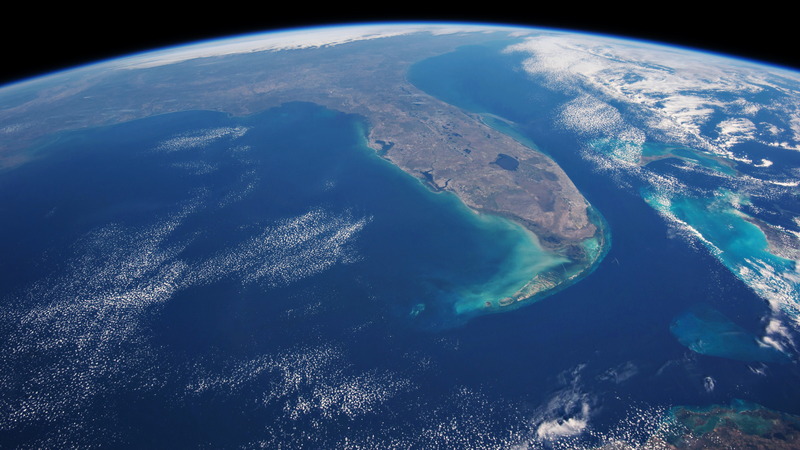 This is a huge positive, although it will not stop the releases from Lake Okeechobee. An educated public is the best defense against the continued destruction of the St Lucie River/Indian River Lagoon. Thank you for being part of the solution and hopefully, next time, the ACOE opens any structure for any reason, they will alert the public, because here in Martin and St Lucie counties, we want to know!